I'm sure you'll manage to get the NE Metal hordes to attend, Donnie. Print out the flyer & stick it up in Vic Flett's. I'm sure you'll manage to get the NE Metal hordes to attend' date=' Donnie. Doing it now and a few flyers as well. hopefully we'll make more noise than Elgin's ever heard. if not, I'll probably fall over drunk anyway. I completely forgot about posting it up here, I'm getting some leaflets etc made up tommorrow and tickets are going in S+V too. 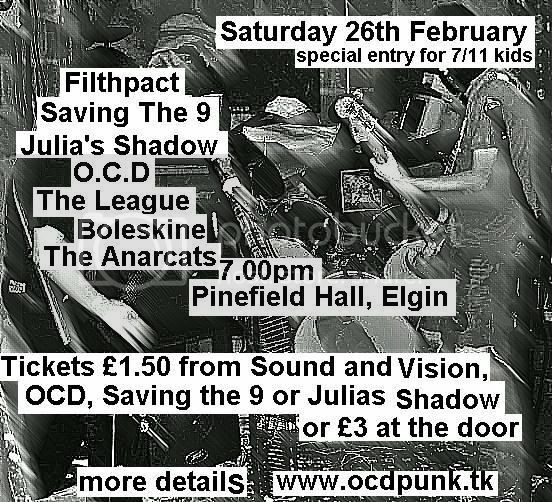 This gig should kick arse, but I'll have to warn you a couple of the bands aren't very "heavy", still its good to have a bit of variation. Can't wait to see the almighty Filthpact! I completely forgot about posting it up here' date=' I'm getting some leaflets etc made up tommorrow and tickets are going in S+V too. This gig should kick arse, but I'll have to warn you a couple of the bands aren't very "heavy", still its good to have a bit of variation. Can't wait to see the almighty Filthpact! Well there are posters plus flyers in S&V, i think Rachel was gonna chase you up about tickets. Theres another poster in Zanzibar (shop on corner beside S&V, Urbanology wasn't open so no poster there. Good luck with the promotion, i might suggest you grab all those up the street on saturday afternoon as potential punters. ...As for some of the bands not being heavy and more importantly does this venue have a bar? are you thinking of the right venue? this place is across the road from brewsters and from my knowledge very few gigs have gone on in there. Anyways i put tickets in, got some leaflets around and on saturday, i'll be leafletting like hell! This gig looks set to kick arses. And yes it does have a bar! The drinks should be cheap seeing as the place is RAF owned so it should be pretty cheap. did anyone in this thread go to elgin acadamy? if so, would someone please care to explain the mythical sport of "elginball"? Never heard of "Elgin ball"
Pinefield Hall. The Piner. Childhood memories. Aaaaaaaaaah. "Elginball" mustn't have crossed over to the south side of the tracks I assume? are you thinking of the right venue? this place is across the road from brewsters and from my knowledge very few gigs have gone on in there. Anyways i put tickets in' date=' got some leaflets around and on saturday, i'll be leafletting like hell! This gig looks set to kick arses. I'm assuming I know you. You said your name was Donnie on another thread, and I only know one Donnie from Elgin. You're second name begins with "S" right? You know me, but I'm nae quite as "me(n)tal as you. Suspicions confirmed. I know you. You know me. Lots of Faith No More references that maybe suggest being a member of the Milne's High posse!!!! Hey all Elgin folk...I'm a Cullen loon but its close enough I guess. Would this be the same game as Murderball? A medicine ball in the centre of the gym and the two teams one at the each end have to bulldog their way to the opposite side of the gym with the ball, the effect being two walls of people kicking the shite out of each other as they clash to rob the ball from the other. Popular in Borstals for getting rid of all that aggression and immortalised in "Scum".